This 2010, Krispy Kreme is back to offer something deliciously different as it launched its Baked Creations held at the its branch in Ayala Venue, Makati City on March 4, 2010. This event was hosted by Mark Gamboa, Krispy Kreme's Marketing Manager. It's a privilege to be one of the few (not only in the Philippines, but in the whole of Asia) who have tasted the newest creations of the world's #1 doughnut chain. 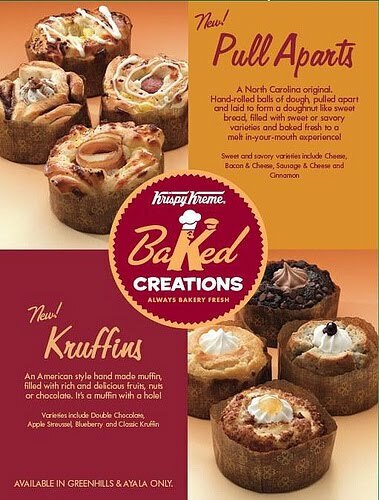 This newest addition to the line of Krispy Kreme offerings comes in two new menu groups: the Kruffins, an American style hand made muffin-with-a-hole filled with rich and delicious fruits, nuts or chocolate with varieties which include Double Chocolate, Apple Streussel, Blueberry and Classic Kruffin. The Pull Aparts – the North Carolina original hand-rolled balls of dough, pulled apart and laid to form a doughnut like sweet bread, filled with sweet or savory varieties such as Cheese, Bacon & Cheese, Sausage & Cheese and Cinnamon. Like the doughnuts everyone has grown to love, these new Krispy Kreme sensations are the perfect companions to Krispy Kreme’s freshly brewed Signature Coffee. Since the 1930’s until now, Krispy Kreme has continually responded to the growing clamor of the doughnut brand’s loyal fans for their globally-famous delights which include the Original Glazed – made from a secret recipe that has been passed on from generations since the store was first established at Winston-Salem, North Carolina, USA. From then on, it has already built a fan base of well-known personalities, which include NBA star Shaquille O’Neal, pop star Beyonce, and even hot Hollywood celebrities like Julia Roberts, Tom Cruise, and Nicole Kidman. In the Philippines, the popularity of the doughnut chain grew the moment it came in 2006 at its very first branch at Bonifacio High Street in Taguig. And with the fresh, mouthwatering pastries that come out of Krispy Kreme’s conveyor belt, its fame is destined to glaze everyone. Rick Cavanaugh (Director of Research & Development) also shared to us some interesting information about the Krispy Kreme's products, some historical background, and how Kruffins & Pull Aparts came about. Grab the new Krispy Kreme baked creations in the dougnut chain’s Greenhills and Ayala stores. You may also visit any of the following Krispy Kreme Branches: Bonifacio High Street, Greenhills Shopping Center Drive-Thru, SM Mall of Asia, Trinoma Cinema Level, SM Megamall, SM Mall of Asia Drive-Thru, Ayala Avenue, Robinsons Galleria, Gateway Mall, Glorietta 4, SM City Annex (North EDSA), Annex 2 SM Fairvew, Eastwood, Marquee Mall Pampanga, SM San Lazaro & SM Manila (coming soon) or call +63.917.8053000 & (632)633-2313. Also, be sure to log on to www.krispykreme.com.ph and be a Friend of Krispy Kreme to get updates.